"Light up the city" 26 May 2012, 12.30am(27 May 2012). Sundown Marathon 2012. As I have little or no experience for running half, a few months before the race, I did some research and seek advice for the run; on the kind of running shoes to wear, the technique on the running and training etc etc. I was that serious. I ran almost every other day, it was really tough. I almost wanted to give up but I know I need to be mentally positive about it. The day finally came, I knew I have to rest and eat well before the race but I was felling extremely nervous so I didn't really get to do what I was suppose to. I reached the venue 2 hours before race time, it was massively crowded. As usual, met up with the FF peeps for camwhoring, I was happy to have met some peeps whom i have never met before, especially The King Sam and made many new friends too. It was an exciting moment taking photos, I felt we were so special because our Tees stands out. I could sense that many other runners were looking at us, wondering what kind of group is this and some unknown photographer took shots of us. It feels really great! The announcement for us to proceed to the starting line came about, I could feel butterflies in my stomach. 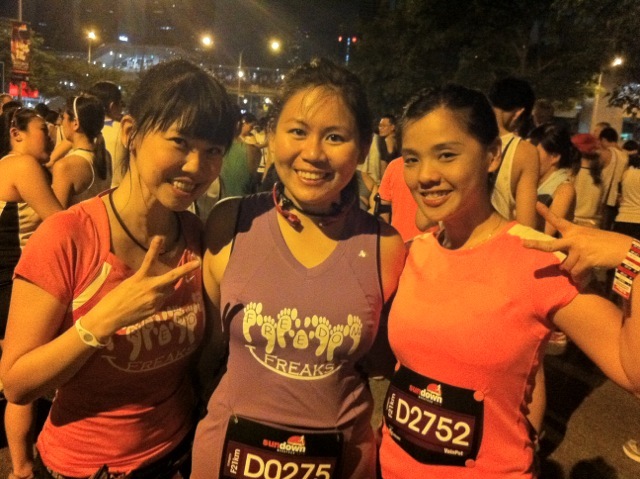 Was relieved knowing that Ying Shan, Eillen and Chee Wah were also running half and we could start the race together. I realized that there were many big lighted up "balloons" indicating the timing we expected to complete to join the queue, so it will not go chaotic I guess. I am impressed that it was so well organized. The race started at 12.30am sharp, we followed the flow and moved to the starting line. A steady 7.30min pace throughout the 10km as I ran along Nicoll Highway towards Marina Bay Sands. Approximately every 5km there were water point and to me, it was a must stop to hydrate myself though it was just a sip of water or a sip of 100 plus. When I reached the 11 clicks mark, I started to realize that I have to take my first caffeinated energy gel to give me another boost to go on. I didn't really remember I was suffering from any pain till I reached approx 14km mark from Marina Barrage to Gardens by the Bay East. I felt both of my hips were a little sore and I knew I have to go slow this time. Looking at my Garmin watch, my pace has increased to 10min and I was getting a little worry by then. I took another energy gel to continue. I was telling myself that if i speed up now, i will definitely make it to 2:30hrs (dreaming only) so I try my best to excel with a drop of speed to 7:30min again. I ran like a speedy gonzales for at least 2km. I felt exhausted at the 16km mark. I told myself that I must not give up since I have gone this far. I need to enjoy the run and complete it. I went on at a pace of 8min because my hips was giving me a slight pain. A gust of strong wind blew across my face and followed by a drizzle. I could see lightning from far. At this moment, I knew, no matter what i have to speed up. The rain was getting heavier when I crossed Kallang heading back to Nicoll Highway. I was completely drenched, an sms just prompted from the organiser to ask to take shelter. Goodness ! I was already totally wet, forget about taking shelter and so I ran on. The wind was strong and the rain was heavy, heavy shoes and vision blurred. Pushed myself really hard on the last 1.5km. Crowds were cheering on, and finally I did it. Board timing indicated 2:51:48. That glorious moment indeed.